Iran and Tajikistan have many cultural commonalities, but among them is a delicious dish which is served in the two states with different names. The dish is a kind of white sweet that is prepared for Iftar and Suhur during the holy month of Ramadan. In Iran, people of Hamadan province call it “Angoshtpich” and in Tajikistan it is called “Nishala”. Fasting people in Tajikistan, just like the people in Iran’s Hamadan, break their fast with this white good-flavored sweet. 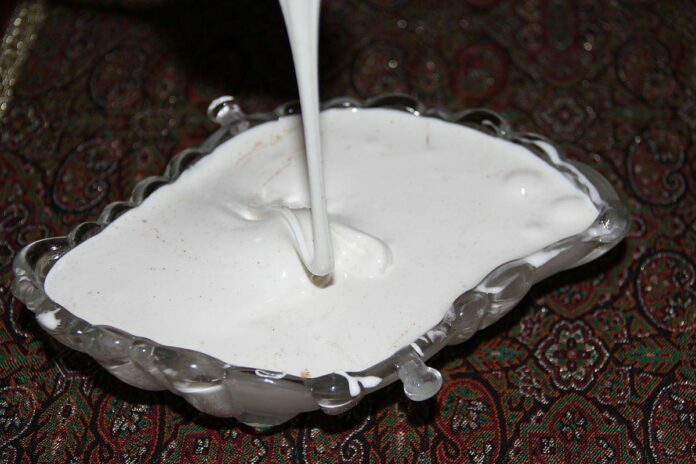 “Angoshtpich” or “Nishala” could be found on Iftar tables of Iranians and Tajiks. Tajik people believe that eating this sweet will reduce the body’s need for water and food. As it is prepared very simply, the Tajiks eat it as breakfast meal during the other months as well. Angoshtpich of Iran is a delicious sweet that is very energetic, and because of its particular form it is called Angoshtpich or something which turns around your finger (traditionally it has been eaten using one’s finger). Although today people do not eat the sweet with their fingers, the dish has maintained its original name. In Tajikistan, the ingredient of Nishala are sugar, egg whites, and roots of a kind of plant that grows in the mountains. However, in Hamadan which is a sister city with Tajikistan’s Kulob, the ingredients are egg whites, sugar, rose water, citric acid and water. These ingredients should be stirred to a degree so that they take on a state like honey. Pour sugar in a large pot and add water to it. Put the pot on medium heat. Then add the citric acid. Let the mixture boil to take a honey form. Turn off the heat and allow it to cool slightly. While the syrup cools, stir the egg whites. Then add it to the syrup and stir so that the mixture becomes completely white. Now, Angoshtpich is ready, but you can add rose water to improve its flavour and use some cinnamon before serving.